This blog post concludes details of our extended weekend vacation (August 5-8) in South Central Pennsylvania. The first day of our vacation was mainly a driving event. We drove 5 1/2 hours from our home in Warren, PA, to our hotel in Jonestown, PA. On the second day of our vacation (August 6) we took a stroll alongside Union Canal in Lebanon and visited the quaint village of Mt. Gretna, where we saw Leon Redbone in concert. On the third day of our vacation (August 7) we visited Hershey Gardens during the morning. In the afternoon we visited the Indiantown Gap National Cemetery. Later in the day we attended Lickdale Campground’s annual Cruise Night. Lickdale Campground was located across the street from our hotel. We made plans to attend the Cruise Night. 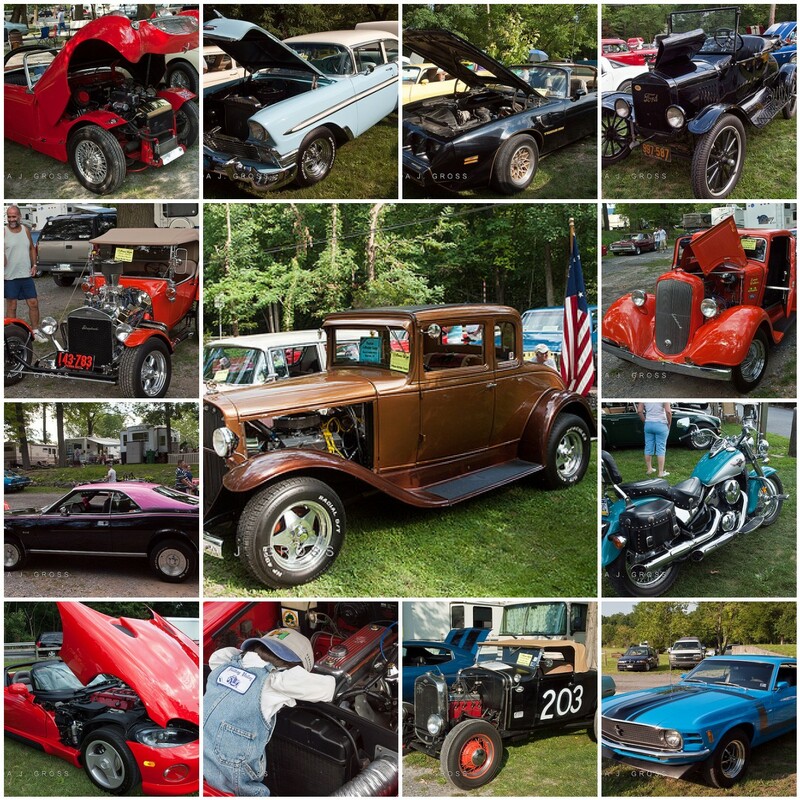 So, one week ago today, we were enjoying the sights and sounds of Lickdale Campground’s 7th annual Cruise Night. This event was free for everyone; however, donations and canned goods were being accepted for Lebanon Food Bank. Bryan Stevenson with “The Hit List” entertained the crowd with music from the 50’s – 60’s. I hadn’t heard of this band before. I enjoyed listening to their music. The Burn-Out Pit opened at 8:00 PM. This was the first time I attended a burn-out event. The first “contestant” only squealed her tires on the concrete pavement. I didn’t take her photograph, as her performance wasn’t a burn-out. The second “contestant” was a man riding a motorcycle. This was the third “contestant”. This man went through all gears, while in the burn-out pit. The car started to slide! The smoke was coming right at us! We walked back to our hotel shortly after that last burn-out. More “contestants” burned their tires after we left; however, we had seen and heard and smelled (!) enough. The smell of burning tires was in my hair, on my clothes and seemed to have permeated my very body! That’s our hotel across the street. It’s shrouded in a cloud of smoke from the burn-out pit. This concludes our weekend in South Central Pennsylvania. We returned home on Sunday, August 8th. Hi Betsy,No, we aren't out on the bike today. Bob is putting in overtime hours at work. He will be home in a few minutes (12:00 noon). The bike is still sitting on the motorcycle lift in our garage. The back tire is off. The final drive is still in the shop for repair. Parts are supposed to be in Monday. Bob hopes he is riding again by next week. The bike has been on the lift long enough. oooh – such fun!! Cool cars, too!Trying to catch back up…. What a great weekend get away and music from the 50s and 60s, what more could you ask for :)? Great shots as usual. More fun. Loved those vintage cars and I've never been to a burn-out either, didn't even know they existed. Good coverage on that. Love all the cool looking cars, my son would love to be there checking them all out. Wonderful photos and mosaic. Sounds like you are having a fun vacation. you seem to be enjoying a lot! take care. Wow, I have never heard of a burn out event before. It looks like it takes talent but I don't think I would like the smell either:) Your posts are always so interesting!